Let’s be honest – we live in a fast-paced world that doesn’t always warrant us time to stop and enjoy lunch — let alone the flowers. To avoid being frazzled and unprepared, set yourself up for success by stashing some of my favorite keto snacks in your desk drawer or snack bag. As I (and Tim Gunn) always say… make it work! Ever since I started following the Keto diet, I’ve become somewhat of a connoisseur of meat sticks. It’s fun to try new brands and meat types – I’ve even had some made from alligator! Foreign to me, but delicious! If food quality is important to you, there’s even an abundance of grass fed options that will leave you feeling satisfied and guilt-free! 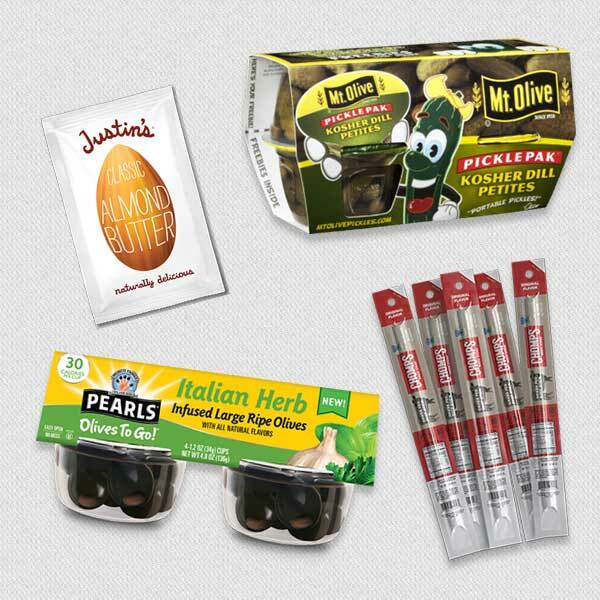 Olives are a personal favorite of mine, and I am loving that there are so many portable options now available. I’ve even seen artisan varieties at places like the movie theater, the coffee shop and even the airport! I love that this is a quick, grab-and-go option that’s full of healthy fats. Personally, the Pearls Olives are my jam. They come in tiny little cups that are perfect to grab and they require no refrigeration. I love the Italian Herb flavor – delicious! Tuna pouches might not be as obvious, though it can be extremely delicious! Even better, if you have mayonnaise packets or the luxury of a refrigerator equipped with your favorite mayo, you can easily whip up a tuna salad at any time! The protein and fat will keep you satiated for hours. In addition to tuna, experiment with other seafood such as salmon, oysters and sardines (these are packed with awesome nutrition). If seafood isn’t your thing, they also make these available with chicken, as well. A spoonful of almond or peanut butter could be all you need to get through a sweet craving or lunch you can’t find the time for. I keep an entire jar of my favorite peanut butter in my desk drawer, just in case. A few companies are even coming out with small, individual pouches of nut butter, making this even easier. Just pull one of these babies out and have at it! These are great options for portion control and for on-the-go, as well! Equally, a handful of nuts can go a long way. You can even get some of your favorite flavored version that will combat any craving you have for potato chips. I have not met a pickle I didn’t like. Actually, that’s a lie. Who even eats those sweet and spicy gherkins? They’re delicious. I’m totally that person that will eat unwanted pickles when at the local sandwich shop. They’re hydrating. Typically, they’re packed in olive oil, pickle juice or water. The sodium intake is encouraged on the Keto diet to replenish lost electrolytes. They’re super low in calories and carbohydrates. Seriously, you can fit them into any plan, keto or not! There are two brands that I’m in love with. The Oh Snap! pickles come in a traditional and spicy flavor (and I mean spicy… they’re addictive) and they’re incredibly delicious. I’m able to find these at my local Target, Walmart, Whole Foods and even in gas stations. This brand in particular is very fresh and they need to be refrigerated, so plan accordingly. My other favorite is the Mt. Olive mini kosher dill cups. These cute little cups can fare just fine without refrigeration, making them the perfect desk snack! You get a nice quantity in each cup, too. Super fun to eat and taste great! When you’re finished, just take a shot of that delicious pickle juice! Nothing satisfies the old cheese tooth like a crunchy cheese snack. I’ve been in love with these ever since I started Keto. They’re great on their own, but can also double as a chip for your favorite dip. If you picked up a salad and miss that familiar crunch from croutons, they can be a wonderful replacement. These are for sure one of my favorite keto desk snacks! Pro Tip: Cheddar cheese chips + peanut butter = the same flavors of those delicious, carb-filled Cheddar and Peanut Butter snack crackers. You’re welcome. Finding a Keto-friendly beef jerky can be a little tricky. A lot of the brands you find in stores are loaded with sugar and have enough carbs to make it not worthwhile. Some days I want to eat a whole bag, and I can’t justify giving up 20g of my precious daily carb count on something that should basically comprised of just meat and spices. I discovered the Keto Carne brand of jerky through Keto Krate, and I’m so glad I did! This brand is known for not containing any added sugar and the label backs this up with 0g of carbohydrates per serving. If that wasn’t enough – it’s freaking delicious! Imagine eating crispy jerky made from your mother’s pot roast. I’m obsessed. Ah, an old favorite. Who doesn’t love fried pork skin? Pork rinds (or chicharron depending on where you’re from) are something I can always find room for. It’s no surprise that these can be a quick and easy go-to from the inside of your desk! They now come in different flavors, too! The sriracha and salt-n-vinegar are personal favorites of mine, but if you find the dill pickle flavor, do yourself a favor and get them. You won’t regret it. You can even go a step further and keep a small bottle of hot sauce in your desk. Swag. My favorite pork rinds are the ones with soft, pillow-y chips and less of the hard- textured pieces. Much like the cheese chips, these can also double as a crunchy element to your favorite salad. Who needs croutons, anyways? My favorite brand is Turkey Hill. They’re amazing! 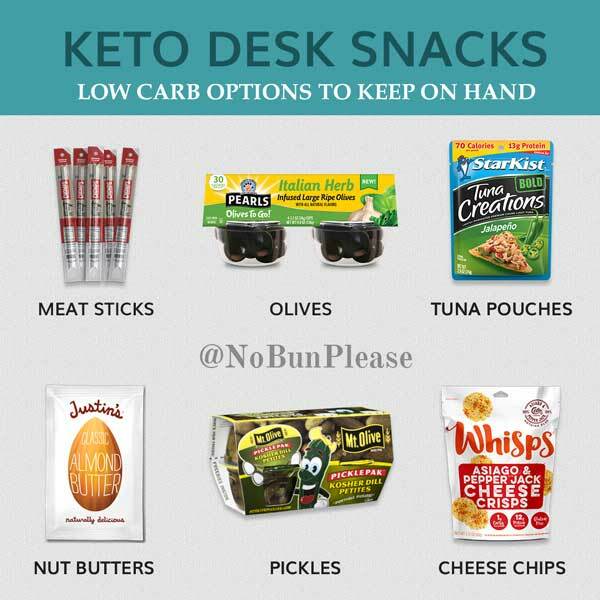 What are your favorite keto desk snacks? Comment below!